Characteristics - Heartwood reddish-brown darkening on exposure, with a slightly wavy figure. Texture uniform fine to medium. Durability - Extremely resistant to fungal or insect attack including termites. 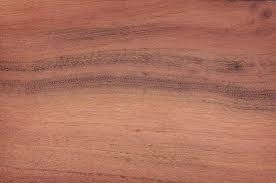 Characteristics - Heartwood of variable reddish-brown colour, with darker longitudinal stripes. Has an interlocked grain and a fine to a medium texture. Durability - Durable, resistant to fungal and insect attack. Durability - Durable, fungal and insect resistant.